It wasn’t even a year ago, and yet for those of us who don’t live close enough to be directly affected, already the disaster in the Gulf of Mexico (I refuse to call it an oil spill, as if someone accidentally knocked over a bucket) has faded from our immediate consciousness. Every day while the well continued to leak there was news on the radio or television or newspaper outlets about the latest kill failure or the recent statistics on observed and expected damage. We as a continent, as a globe, were angry and indignant first that this could happen at all, and second that there seemed to be collective feet-dragging to do anything about it. The devastating leak was finally capped July 15, after raw crude had continued to flow into the waters of the Gulf of Mexico for three long months. Three months. 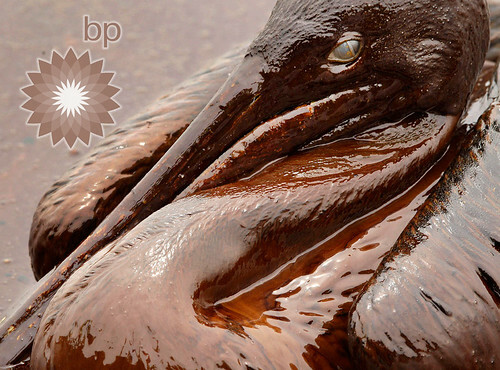 And on every day of those three months, roughly 8,400 m³ (11,000 y³) of oil spilled out from the wellhead. This is such a huge number, it’s hard to understand. Let’s put it another way: it would be the equivalent of having three-and-a-half 53-foot transport-truck rigs dump the entire volume of their trailer on your front yard every hour. Eighty-four truckloads of crude every day. Eight thousand trucks over the course of three months. Try to imagine what that would look like dumped in your yard, spilling into your street and neighbourhood. Imagine what impact it would have on your neighbourhood. The fact that it happened at the ocean floor within a large body of water makes it no less significant. Did you know that, more than 21 years later, there is still oil in the shoreline habitats of Prince William Sound, the legacy of the Exxon Valdez disaster? That Exxon weaseled out of paying most of the court-awarded damages through successive appeals that lasted nigh on 20 years? That a study done 15 years post-spill showed that many species of wildlife had still not appreciably recovered? This includes Pacific herring, once abundant enough to support local fisheries, which have still not opened again. Think of how devastating this was, and continues to be, for those communities. In this post, N8 puts forth several ways you can help, and important links to aid you.